Reading and writing is a general skill that makes you more efficient in whatever job you have. In the future programming skills will be needed in many jobs for you to be efficient. In programming the lonely hero used to be revered for their mastery of this skill, but today programming is a team effort where team communication, management and planning is required. Programming is still a skill where you will fail many times before you succeed, but standard frameworks are making things much easier. To quickly give students a feeling of success, while learning programming, we should focus on the visual parts that give immediate feedback. The principals of programming can be learning in any programming language. 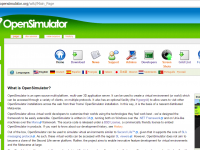 The virtual world simulator OpenSimulator uses the script language LSL, that can be used to move 3D objects and define actions when the user interacts with the 3D scene. This is a fun way to learn simple programming. What makes our 3D world a quality learning tool?